Queensland Urban Utilities is committed to excellence in water and sewerage services that meet the evolving needs of our customers and enhance our communities. As part of this commitment, we have a water main replacement program to replace sections of water pipes as they near the end of their service life. The newly installed water mains ensure the reliability and sustainability of water services in your area. Some of the pipes that are due for replacement are made from asbestos cement. These pipes were laid before 1954. It is ‘bonded’ asbestos which means the fibres are tightly bound within the cement. When undertaking a water main replacement in streets with asbestos cement pipes, we replace the pipes with new ones made from longer lasting material. The work will be carried out by licensed asbestos contractors in compliance with stringent Work Health and Safety regulations. Safe Work Methods will be followed to ensure the safety of the public and our contractors. Ensuring contractors wear personal protective equipment and signage is in place to let everyone know what is going on. There are no health risks associated with drinking water that has been transported in asbestos cement pipes. The effects of asbestos in drinking water have been extensively studied and results have shown there is no elevated risk of asbestos-related disease. Asbestos fibres are only deemed hazardous when they become airborne and are inhaled. More information can be found in the Asbestos Health Risks Guidance Note or by contacting Queensland Health on 13 HEALTH (13 42 25 84). Why is the work required? 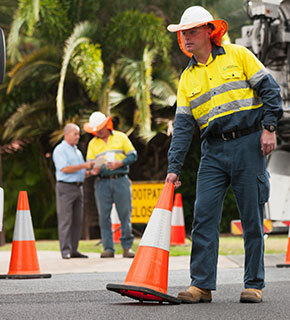 Queensland Urban Utilities has a water main replacement program to substitute pipes as they near the end of their service life. Some of the pipes that are due for replacement are made from asbestos cement. Queensland Urban Utilities will remove these pre-1954 asbestos cement pipes and replace them with new pipes made from longer lasting material. Will there be any safety risk to residents during the removal of the asbestos cement pipes? No.The asbestos cement pipe will be coated in water prior to removal. This prevents particles from becoming airborne. The work will be performed by licensed asbestos contractors in compliance with stringent Work Health and Safety regulations. Safe work methods will be followed to ensure the safety of contractors and the public. What specific safety precautions are taken? There will be construction-related noise and dust, changed traffic conditions, and some planned interruptions to water supply during this work. Affected customers will be notified at least 3 working days prior to planned water outages. Is it safe to drink water that’s been transported in asbestos cement pipes? If you have any further enquiries regarding the health related aspects of asbestos in drinking water contact 13 HEALTH (13 43 25 84) or visit the Queensland Health website. Is there asbestos in our drinking water? Under the Australian Drinking Water Guidelines, we are not required to test for the presence of asbestos as it is NOT harmful to health if ingested in water. Asbestos fibres are only deemed hazardous when they become airborne and are inhaled. Will trees have to be removed during these works? It depends on each individual project. When excavation work is required on a footpath, sometimes trees have to be removed and we would apply to the relevant council for a permit to do that. Qualified tree removal companies are contracted to do the work, and the trees are replaced during offset plantings with a similar variety in a more suitable location. If you would like further information on our water main replacement program call us on 13 26 57.